Although peeking through the pale mud with life and vibrancy, the young mangrove regrowth looked naked and vulnerable against the open swamp, and without the mother-tree nearby. In the distant, under the long shadows, piles of de-skinned fallen mangrove laid like stacked cadavers. This was part of an extensive wetland area used for fishing and gathering food like sugo, small snails and Kina, a fresh water mussel. 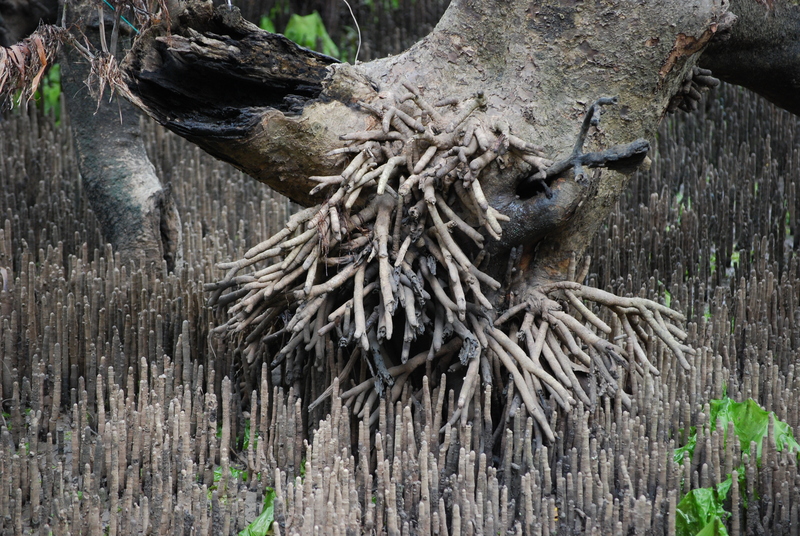 There was some kind of an order in the distribution of the mangrove shoots along the random waterways. It was a peculiar, and neat arrangement. Amongst this orderly disarray, I stood out like the tallest cross in a dwarfed graveyard. The young mangrove shoots only came to my knees, just like the old stumps. I must remove myself from here, I had thought although this had always been our favourite fishing spot. Today, the place felt strange, unlike before. Before, we would fish for hours and take our breaks on the logs. We ate with one hand and smacking of mosquitoes, then wiping their blood off and scratching the small bite mounds with the other hand. I had been to this place with my Grandma and Aunty Yellow. I also came here with my cousin Alison before she lost her mind to Malaria. I should not have been here alone today. Once when Alison was eleven and I twelve we spotted a stranger here. On that day, we had brought with us Tinang’s (grandma) bush knife, which we were forbidden to use. The bush knife had cost a lot of money and one bush knife served many families in many ways. It turned out, the man we had seen was not a stranger, nor was he real. From his actions and the way the Sockwing (a type of wag-tail) birds were calling, my cousin and I became alarmed and we ran off, leaving grandma’s bush knife behind. I had to run back and get it. If we had left the knife there, we would have been punished for taking the bush knife. We were told that same evening, the man we had seen was a spirit of a dead great-uncle. This too was his favourite fishing spot. I thought I saw a movement and my eyes tried to focus. Nothing seemed out-of-place, and everything around me looked like it had always been. The Japanese bombing in the Second World War left a large gap in the wetlands. The bombs opened the place as wide as a soccer field, and made it lifeless; right in the middle of the thick mangrove that was relished by fish, birds, snakes, lizards and all kinds of insects. My Aunty Yellow said, in the open centre, mangrove regeneration since the bombing struggled for decades. The bomb explosions took both natural and human lives; our great-uncle was amongst those. Apart from the war, this place was a landmark because the mouths of many small creeks gathered into the head of the largest one, which flowed into the main river, named Bu-dac. Budac meant Blood River, a name that reminded us of our history. Our house was built along the river near its centre and at the entrance to our village. In pidgin, it is called, maus-rot which means mouth road. I was standing at the head of Budac. There was a large T-junction, where the main creek met the river. The swamp clay was very soft and pale and covered with dead rotting leaves. In the dark river, life existed; a place where fresh-water fish feeding, spawning and nursery took place. Fish gathered daily to feast on other fishes and debris collected and deposited by the creek as well as the river at this meeting point. Not today, I had not seen fish movement breaking the water rhythm nor its surface. I could not understand nor remember why I was here today, and alone – only a few kilometres away from our village, just outside Lae, Papua New Guinea. Love your blog. I have memories of my mum and her bush knife. Such an integral part of her childhood and our life. Also memories of seeing a plane wreck in Kiribati. Some wonderful detail in your story of the mangroves especially and some important people in your memory. Hi June, thank you very much for visiting, and gutpla tru long lukim meri wantok. It was very kind of you to comment and share your story too. Laikim.